Welcome to the Reach High Scholars website! 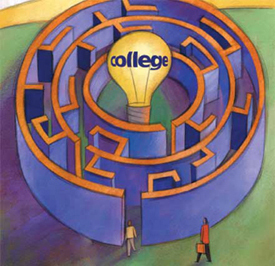 Starting to think about college can feel like entering a big, confusing maze: you’re aiming for an uncertain goal in the center, and you’re not sure which way to turn to get there. The aim of this website is to break the process into manageable chunks and to empower you to reach higher in your educational pursuits than you would have previously imagined possible. The experience can be fun and exhilarating. You will be playing out the motto of the Reach High Scholars Program to control your destiny. going on to excellent graduate programs and jobs. "The Reach High Scholars Program inspired me to be the best student that I could be on a daily basis. I was developing a sense of where I wanted to be and who I wanted to be. It made a huge difference in where I am today. I learned from RHSP that the price tag is no means what you pay. I have modest government loans and I am responsible for about $1,000 per year." "RHSP gave me the resources to be prepared for the college process. It helped to identify the right questions to explore and how to answer them."